The Flauto Rondo is a good flute with a nice sound and good response. I bought the flute because of the double flap, actually more from curiosity, whether this brings a lightning in the game. Unfortunately, I was disappointed. The flap is visually beautifully processed. But it can not be adjusted so that both sounds can be played clean. The levers are bad, either the F responds well, or the Fis, both together is almost impossible. So I would have to twist the foot with the flaps slightly whenever I change the key, or as I just need it. Under the game this is not possible. The good flute, as the flaps are what this flute should be, is worth it. 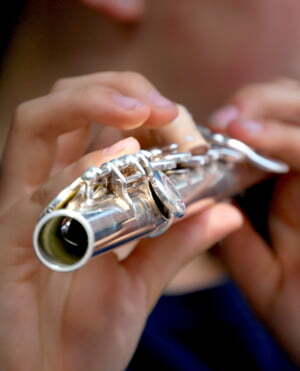 Unfortunately, there is no foot to buy alone, which would not be a bad thing, if for every flute to buy individual parts. This should not be a problem with today's machine production. Surely a money thing, introduced by the companies deliberately. The design without flap is definitely better, since the double flap here brings no relief in the game for people who have problems in grasping the lower holes. Whoever is looking for a flute with a double flap should look at the Canta of Mollenhauer. Here, Mollenhauer has developed a mechanism that works really well, where both sounds can be grasped well, and a fluent play is possible. As a flute with a double flap, I would like to call the Mollenhauer Canta as an alternative here. I can recommend the Flauto Rondo only without a flap. I hope to help with this decision. ID: 290845 © 1996–2019 Thomann GmbH Thomann loves you, because you rock!